Meet the Little Bigfoot Lion 2014 edition! He is handsome isn't he? I do have a partial video tutorial now on youtube that will show you how to sew the doll together plus how to stitch a nose to the muzzle, add in the end of the tail, root the mane plus a few options for the eyes. If you need help with stuffing or even making some of the parts please see one of my other LBF patterns, they are all stuffed and shaped the same way. The legs and arms are mostly the same and the heads will all begin the same way so one of the other video tutorials will be very helpful in making the lion if needed. *This lion's mane is rooted in and it takes time, about 2-3 hours depending on individual speed and experience. If you'd prefer a project that takes less time then this pattern will not be for you. down this page for the lion pattern. you can use buttons, a french knot or paint eyes on. I used safety eyes that I glued in place. I used 7.5mm for the lions pictured. 8-15) 1sc in each st for 8 rows *if using safety eyes, they are in between the 11th and 12th row with about 6 visible stitches between them. 33) 1sc in next 2st then 2tog (18) *stuff and shape body. Make sure to add stuffing into the neck area if needed. You can stuff more into the body over the next 2 rows. Cap for the yarny mane: Use the same color you will use for the mane. You can skip the cap and just root the mane directly to the head. I've done it both ways and I found 2 advantages to making the cap. One, you will not have any troubles with pulling stuffing through the stitches and two, the yarn appears fuller and stands out more if rooted to the cap. I prefer the looks of the mane when attached to the cap. sl st and f/o leaving a long tail for sewing. Using black yarn, whip stitch a nose onto the muzzle. Stuff muzzle. sl st and f/o leaving a long tail for sewing. Lightly stuff hand, very lightly stuff arm. 6) sew the ears to the cap. The front bottom edge of the ear should be about 2 rows back from the edge of the cap with about 8 visible stitches between them. 7) sew the outer edge of the cap to the head, make sure to center the muzzle between the ears. Do not put any holding stitches on any other parts of the cap. You need the cap and the head to be separate so that it is easier to attach the mane. 8) wrap the yarn you will use for the mane around your hand until you have a good size bundle. Take bundle off your hand and cut through one end so that you have single strands of yarn. 9) for the first row of rooted strands start on the outer edge of the cap, insert your crochet hook through the head and the edge of the cap at the same time and pull a strand of yarn through, pull the 2 loose ends of the strand through the loop and pull tight, This row connects the edge of the cap and the head. 10) Root the rest of the cap now but do not go into the head, root the cap only until the entire cap is filled. Take a break when needed, this will take a while but the results will be worth it, I promise! You will also need to root yarn around the face too and this will be rooted directly to the face. Trim the yarn but do this part very slowly and take your time, you can not fix the mane if you cut it too short so it's better to take as much time as you need to get the best outcome. Please view the video on attaching and trimming the mane. yes! he is so handsome sensei!! even though it's 4:14 in the morning here in Bahrain, I'm going to start crocheting him! Thank you for posting this pattern and so many others. I have tried a few of your patterns now (with varying degrees of success due to my own lack of skill!) and they are so easy to follow. Many thanks. Thank you for posting these! You have such a talent for teaching and your videos have such a grace and patience that has made this experience VERY pleasant and quite enjoyable!! THANK YOU!! These are absolutely wonderful!!!!! I am so excited to create more and follow your work!! I am so excited for more!!!!!!!!! Your animals are so adorable, and after watching your videos I'm wondering why I never thought to pin the pieces to the body as I was stitching them... duh, that looked so much easier. 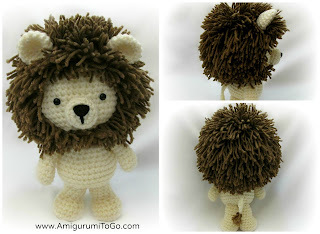 Also wondering if you would be able to use a latch hook for the lions mane. I haven't done latch hook in years but would that make it go faster? I actually have never tried a latch hook for this process. It might work ok for the cap but not if you were rooting the head directly as that would just pull stuffing through the stitches. Hi, I Started this pattern but i'm confused on ( 8-15) 1sc in each st for 8 rows *if using safety eyes, they are in between the 11th and 12th row with about 6 visible stitches between them. ) do I do 7 rows or 8 rows of sc ? when and where you put the eyes has nothing to do with the number of rows you do. I was just giving direction. If you are using safety eyes then you want to install those in between the 11th and 12th row. Once you have finished row 15 then you can put your eyes in. So i can do 7 or 8 rows? In the pattern it says 8-15 rows of sc (which equals 7 rows) but right after that you say "for 8 rows". That's where I'm confused? It actually equals 8 rows. Row 8 is included in the count. It used to confuse me as well when I first started but you count each row as it is written. Iv almost done the lion how would I make a bigger one. If the pattern gets done up without the mane, does it look like a passable lioness? 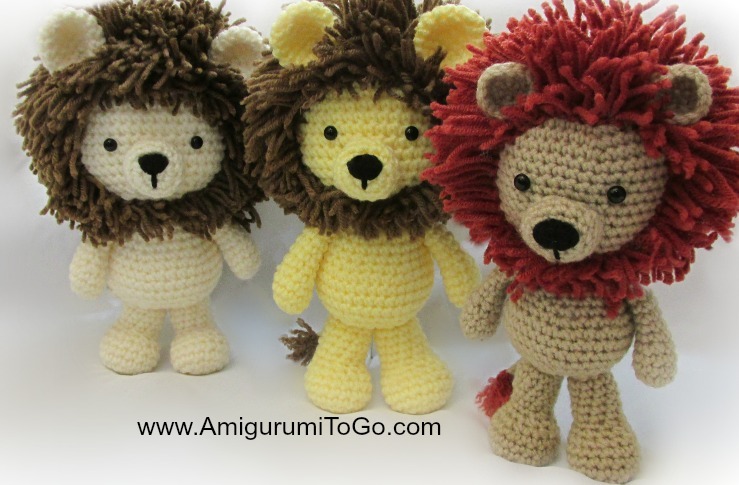 This is by far the cutest lion pattern I've seen, and I want to make a lion version for each of my family members and am hoping that my lioness will still look sorta cute next to a trio of these little lions! I'm so happy That I find your blog.. And YouTube tutorials. You are my God in Crochet world!!!! My name is Dorothy Simpson and I just love your Bigfoot animals. I think I have something that would help you. When doing the Lion's mane you can use much shorter pieces of yarn. If you leave your hook in the loop you pull through the cap you can catch the ends in it and pull them through - much quicker and easier than using your fingers. I have always done it this way when doing doll's hair and believe me it really saves not only on the amount of yarn you use but also on the amount you have to cut off when you shape the 'haircut'. Thank you for sharing your talent with us. I use 8mm most of the time. But 7.5mm and 9mm work just as nice in most 8 -10 inch amigurumis. But sometimes a larger eye looks cuter.. it depends on the character I guess. I buy eyes online. I have many eyes in the wrong color but I just paint those and seal the color in with clear nail polish. I don't know how well that would hold up in a washing machine though as I've never thrown one in to test it. Are you aware of problems with typing in this comment area?? I NOW type first in Notes then c/p it here. Guess can try asking Google about Google problem, wonder how hard that is?? It works great as long as you don't make any errors, won't let me correct, or sometimes even type. no, I haven't heard or had any problems with the comment area. Is this the first for you or have you always had troubles in the comments? Al I can tell you is use the hook size and yarn weight that I have suggested in the supplies list. Make sure to add in a marker and move that marker at the end of every row. That way you can keep track of your stitches, and be sure to count your stitches every once in a while. As long as your stitches and row count match that of the pattern then you know you're on the right track. My mane cap is to big for my lions head. Am I suppose to use a smaller hook for the cap? I used 3.75 for everything. no, it's the same hook size. It shouldn't be too big but just a bit larger so that it fits on without having to squish the head. I can't remember if I show putting it on in the video or not but check it out and see how mine fits in the video. I cannot understand why my mane cap is bigger than my lions head :( I used the same size hook for everything 3.75. HELP ! Hi my name is Tiffany and I was wondering when you were gonna make the stitch by stitch video for the Little Bigfoot Lion? The lion is my favorite one you have made so far but I'm not super good at doing it off of written instructions. It would help me tremendously if you would make this video! Thanks for your time. I just made youre giraf for my son in grey and blue. And it turned out great. and now i'm eager to begin on this lion. I want to say thank you for your great tutorials. They are so easy to follow. I simply love this pattern. Any suggestions on how to incorporate some whiskers? Hi Sharon, I appreciate your patterns so much..I have done the monkey, the giraffe, and i am working on the lion revised addition..I liked the muzzle and nose from the 2012 additions better..I will put pics on your FB soon...I have noticed that in the legs for sure when you do the second 2tog it says 2tog, 1 sc, 3 times and then 5 sc.. but you can only do 2tog, 1 sc. 2 times and 5 sc. Thank you so much! that's awesome, I'm so glad to hear it and I'll look forward to your photos. crochet 2tog then put 1sc in the next st ~> repeat the sequence ~> 2tog then 1sc in the next st ~> repeat again for the 3rd time ~> crochet 2tog then put 1sc in the next st. If you repeated it 3 times you have used up 9 stitches. so put 1sc in each of those 5 stitches. I'm really enjoying this pattern, and I'm nearly done! He's looking amazing, but I'm wondering how you made them stand up on their own? There's so much weight in the back that he just keeps toppeling over! What size is the finished lion with the suggested hook size? Hello I am new to your group and first knit. I have creates 2 bunny 2015 and would like to know if the lion is from Wee Bits Basic Body Pattern or from the bunny body that is bigger in size? Thanks for all patterns is amazing. no they are completely different patterns. Do you have videos for body patterns for the lion? I see the video how to add the arms and how to make a had bad no the body. I love to see videos for me is easyer. it's been a couple yrs since I did the video but I think I remember sewing and rooting the mane on film. Did you watch the video? All your patterns are awesome. I made few of them but one problem I'm facing how your all dolls stand by there own without support. mine are standing with props for photo purposes only. Sharon! Thank you so much for all these wonderful patterns! I have become an amigurumi addict! My grandson LOVED his monkey! I am having so much fun making these for my friends and family! Your instructions are wonderful and your videos are amazing! Thank you, thank you, thank you! Hi! I've made several amigurumi andimals before and I was wanting to make this lion "normal size" or using the body size of the Dress Me Bunny. I was wondering how big I would need to go for the cap, because I realized that the cap here is bigger than the head (for obvious reasons) so I was wondering if you knew or if I'm going to have to experiment? Hi Sharon! I would also like to thank you for all your wonderful patterns. I am able to follow them with success even though I'm a beginner. I have almost completed the Little Bigfoot Lion for a friend's 4 year old son. I showed him the mane with and without the wig cap and he insists on without. I don't see any instructions for rooting the mane without the wig cap. I have the general idea, but would like to know what round to start rooting. Anything else that you think I should know would be really helpful. Thanks again, you're amazing! Hi there, thank you so much for the kind words. I'm so thrilled to know you are having success as a beginner, that is always my hope! It's been over 2 years since I've published this pattern so I'm lost on what row count to start rooting the mane, you'd have to just eye it up. I would suggest putting on the muzzle and eyes first. Also, pin the ears on after you have the face together and play around with placements before sewing them in. After you have the face and ears in place then start rooting the mane. It'll work out just fine. I hope that has helped. He's all put together now, only the mane to go and I found some really neat yarn in my stash that will make his mane look nice and full! I can't wait to start...actually I think I'll start now! :) Thank you for getting back to me so quickly. By the way, I saw the Dragons and fell in L♡VE - can't wait for the pattern! it could be you need to tighten up your stitches. It could also be your hook is too large for the weight of yarn you are using. If those are not the reasons then try the invisible decrease. When you crochet 2 stitches together, crochet those 2 together in the front loops only. Try this and see if that helps. What are the brackets number for? As for number 3 in making the head do u continue the pattern till u get to the end? Связал получился замечательный лев . Огромное вам спасибо. Thank you so much for this pattern. I found it very easy to follow, and it came out better than I expected. Love your work. Are the 2012 versions of the Little Bigfoots still available somewhere? I just found your revised version of the lion and I'm excited to try it. I've successfully completed the elephant,monkey, giraffe, bunny, pig, and fierce dragon. I was never able to read patterns until I found yours. Thank you for making them easy to follow and adding the videos. I love crocheting and your patterns. Awesome pattern. You did such a great job explaining everything. Wish other patterns were as detailed as yours. Keep up the good work. Hi: I will attempt to make the lion. My question is about eyes. How to I place them? At what point of the steps? Thank you. I made the elephant and he turned out great! I am going to do the lion now. I see that you have two sizes in the video above. I'd like to make the larger one at some point...is there a pattern for the larger one available? Thanks and Love your work! that's awesome, have fun! This post that you are commenting on, Little Bigfoot Lion 2014, is the larger lion. The smaller lion pattern is dated 2012. Hi Sharon, would I like to know how I can do it to make it bigger? I want it to be about 20 inches. What advice can you give me?